October 17, 2017 - The HumPRCTM Series by Linx Technologies is a complete wireless remote control system. It supports both 8-button remote control and mixed remote control/data networks. In addition to modules, a finished remote (including plastics) is available which can be quickly modified for a customized solution. No programming is required, making it the easiest solution to implement. The HumPRCTM supports long-range operation at 868 MHz and 900 MHz for multi-region operation, utilizing frequency hopping and industry-standard encryption for secure and robust communications. The HumPRCTM interoperates with Linx’s HumPROTM family, making it the only remote control solution available that simultaneously supports data applications for seamless integration with sensor and control IoT applications. Linx Technologies strives to make every engineer a hero in record time™ by minimizing the risk, delays, and technical challenges for design engineers to make their products wireless and connect to the Internet of Things (IoT). 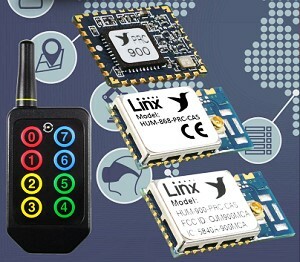 Linx manufactures wireless components including antennas, modules, remote controls and RF connectors. If you choose to incorporate our components in your design, we relentlessly focus on ensuring your successful product launch. Our tag line is Wireless Made Simple™, meaning that we specialize in making the complex world of radio frequency easy for engineers of all skill levels to use. Unlike other wireless suppliers, every aspect of our products, documentation, support, and design experience are specifically crafted to achieve Wireless Made Simple.